I have no idea where I found this tortilla recipe. I have a feeling it's one of those recipes that is past on from someone you know, and then you made it for so long it feels like your own. If anyone knows me I seem to be allergic to too many things, so I like making my own things so that I know exactly what goes it in - so that is why I wanted a tortilla recipe in the first place! 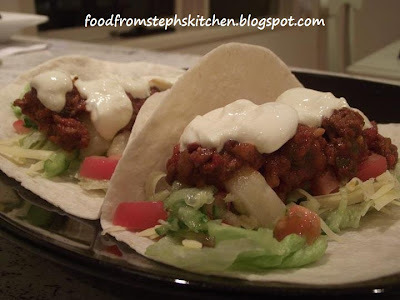 I love making these for tortillas or burritos with chilli mince, but they are also great wraps for lunches - with grilled chicken for a Caesar wrap, or beef strips for a Thai inspired wrap with chilli and lime dressing. They really are easy to make, and sometimes if I don't have time I don't let them rest. Resting the dough does make them a little fluffier though, but when you are in a rush to get lunches done resting doesn't seem like a necessity. It is always better to follow the recipe step by step though! Makes approx 6 medium tortilla wraps. That's it ... I'm not joking! Add all the dry ingredients into a large bowl, mixing together slightly. Make a well in the middle of the dry ingredients and add the oil, following by the water bit by bit. I always leave a little bit of the water out until I start to mix the mixture and can tell it's not going to be too wet. Start to mix things together with a wooden spoon, using your hands towards the end to knead things together. Turn out onto a floured surface and knead until the mixture feels smooth. Rest for 10-15 mins before rolling out into a long sausage and cutting into 6 pieces, then roll each piece into a ball. From here simply roll out into thin-ish wraps - a couple of millimetres*. After you have rolled out your wrap sprinkle with a little bit of flour to stop them from sticky to each other as you continue to roll. This flour is also needed when we cook these off. Set an non-stick electric frying pan or frying pan on the stove to a low heat. Add the wraps one at a time cooking on each side until it bubbles and turns a light golden colour in places - note it won't happen everywhere like a pikelets, so don't wait for that or it'll just turn into a crisp! You don't want to cook them too much as you want them to be flexible enough to fold. If you are finding they are sticking or cooking too much in the pan just sprinkle a little more flour over the tortilla when cooking. * If you are not sure how thin try just rolling out one as a tester, then before you go onto the rest cook it to make sure it's not too thin.